The KlevaKlip fastening system is a multi-board concealed fixing clip system that allows for fast and simple installation. KlevaKlip teeth will lock wood boards into place creating a smooth, consistent deck surface without a view of screw or nail holes. The KlevaKlip range works flawlessly with Trex composite decking. Long lasting, durable joist hangers that last as long as your deck does. Flexible, sturdy connectors that are the preferred fixing method of buiders worldwide. A stable, easy to install adjustable substructure system for your composite decking. A simple to implement support system for use above concrete with limited ground clearance. KlevaKlip’s revolutionary Joist Hangers are made from Fibre Reinforced Engineering Polymer, also known as FREP. This polymer material is used in production, engineering, and motorised applications throughout the world due to their complete robustness and adaptability under load. Engineered to last as long as your deck, these joist hangers are reasonably priced and are corrosion-proof. The FREP Joist hanger suits 90mm X 45mm & 140mm X 45mm joists. KlevaKlip’s Joist Connectors have revolutionised how you can attach joists to bearers. The flexible, sturdy connectors are an must for anyone installing a deck, quickly becoming the preferred fixing method of many builders. The Joist Connector makes the set-out and fixing off of your substructure a breeze. KlevaKlip Joist Connectors are designed to attach 45mm width Joists to 70mm, 90mm & 45mm width Bearers. Fixing up sub-structure bearers and leveling posts for the deck can be a long, drawn-out process. Adjustable Post Stirrups are designed for use when building decks that are Approx. 300mm to 600mm above ground. The Adjustable Decking Joist Support tool is designed precisely to allow wood decks to effortlessly be built above concrete blocks in areas where ground clearance is limited. It is best used when the depth is a minimum of 100mm / 4 inches to the approximate maximum of 260mm / 10 inches from the door step – down to your concrete slab. 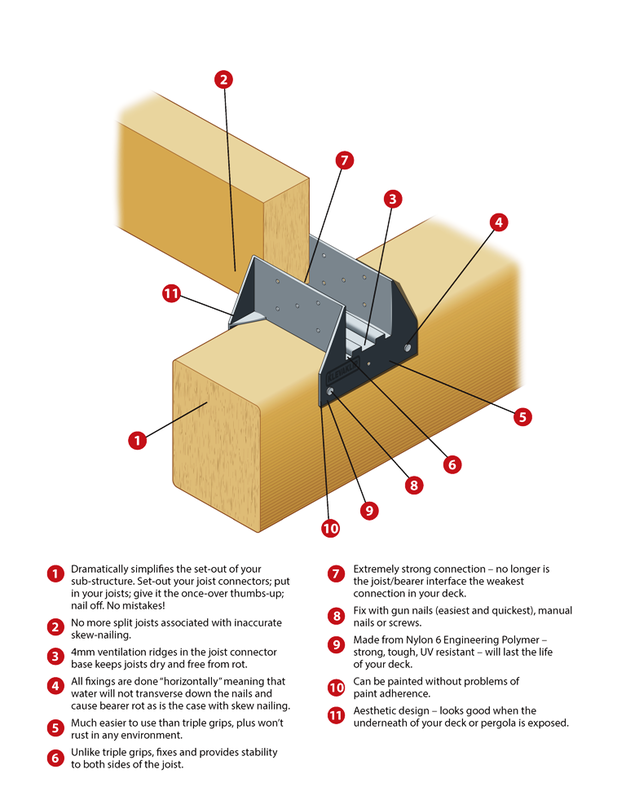 The product AJH45G designed specifically for treated timber joists that are 45mm wide. It can be used with other types of joists if they are the right thickness. The product contains joist supports and base plates. For example, washers, bolts and nuts should be purchased separately depending on the desired height.